A team of researchers from the Massachusetts Institute of Technology has recently announced a new, safer method to handle phosphorus – a chemical element which is a critical ingredient in fertilizers, pesticides, detergents, and other industrial and household chemicals. Their technique reduces the hazards involved when working with phosphorus using relatively simple solutions. Nowadays phosphorus serves in many industries, and it is commonly known as a major component in fertilizers, pesticides, and detergents. The recent study, conducted by Massachusetts Institute of Technology (MIT) chemistry professor Christopher Cummins and one of his graduate students, Daniel Tofan, shows a new way to attach phosphorus to organic compounds by first splitting the phosphorus with ultraviolet light. According to the paper, most natural phosphorus deposits come from fossilized animal skeletons, which are especially abundant in dried-up seabeds. Those phosphorus deposits exist as phosphate rock, which usually includes impurities such as calcium and other metals that must be removed. By practical measures, it requires purifying the rock – a process that produces white phosphorus. White phosphorous is tetrahedral, meaning it resembles a four-cornered pyramid (having four atoms) in which each corner atom is bound to the other three. Known as P4, white phosphorus is the most stable form of molecular phosphorus. For most industrial uses, phosphorus has to be attached one atom at a time, so single atoms must be detached from the P4 molecule. This is usually done in two steps. First, three of the atoms in P4 are replaced with chlorine, resulting in PCl3 — a phosphorus atom bound to three chlorine atoms. Afterwards, those chlorine atoms are displaced by organic (carbon-containing) molecules, creating a wide variety of organophosphorus compounds such as those found in pesticides. While the results of this procedure are currently satisfactory, it is both wasteful and dangerous — chlorine gas was used as a chemical weapon during World War I. 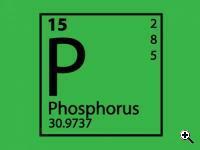 Therefore chemists have been trying to find new ways to bind phosphorus to organic compounds without using chlorine. For the past few years, Cummins’ research group has been looking for ways to break P4 into P2 in hopes of attaching the smaller phosphorus molecule to organic compounds. In the new study, Cummins drew inspiration from a long overlooked paper, published in 1937, which demonstrated that P4 could be broken into two molecules of P2 with ultraviolet light. In that older study, P2 then polymerized into red phosphorus. Cummins’ fascination with phosphorus is in part because of its unusual tetrahedral P4 formation. 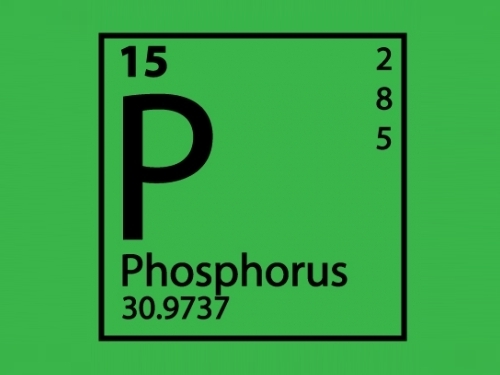 Phosphorus is in the same column of the periodic table as nitrogen, whose most stable form is N2, so chemists expected that phosphorus might form a stable P2 structure. Although that is not the case, Cummins decided to further pursue this approach. He decided to see what would happen if he broke apart P4 with UV light – just like in 1937 – in the presence of organic molecules that have an unsaturated carbon-carbon bond (meaning those carbon atoms are able to grab onto other atoms and form new bonds). After 12 hours of UV exposure, Cummins found that a compound called a tetra-organo diphosphane had formed, which includes two atoms of phosphorus attached to two molecules of the organic compound. In his paper, Cummins suggests that P2 forms and then immediately bonds to the organic molecule. Since he could not conclusively prove this claim, Cummins hopes to directly observe the P2 molecule, if it is indeed present. The technique presented in the paper cannot be applied to produce the quantities needed for large-scale production of phosphorus compounds. However, it does open the door to a new field of research that could lead to such industrial applications. Other future studies, according to Cummins, could rely on his results in order to investigate other potential organophosphorus compounds. He plans to try and synthesize several elements with ultraviolet light; for instance, he has already created a nickel-containing organophosphorus molecule, which could have applications in electronics. TFOT also covered the completion of the smallest transistor ever made, built out of a single phosphorus atom in silicon. For more information about the new technique to use phosphorus, see the official press release.